We are committed to advancing the highest standards of eye care through continuing education activities. The CSEP Semiannual Scientific Education Programs are dedicated to improving and protecting our patients vision and eye health by presenting advances in the diagnosis and treatment of eye disease. Our target audience includes ophthalmologists and their staff, including office managers and technicians. Activities range from didactic lectures to participatory activities, and whenever possible are approved for CME credit. We expect that our audience will incorporate best practices, as presented, into their daily practice. Specific competency, performance and patient outcome goals that will result from the program will be proposed by the presenters and evaluated by the participants. 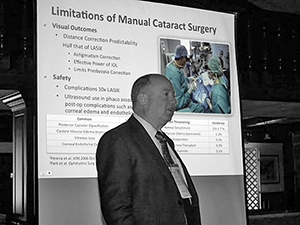 The CSEP Annual Scientific Education Programs are an opportunity for ophthalmologists to identify and discuss critical issues facing their profession. These programs are designed to present recent advances in the diagnosis and treatment of eye disease, offering symposia, scientific papers and videos. The CSEP programs are designed to meet the clinical and educational needs of its members and the objectives set forth by the CSEP education committee.